Two descriptions this morning of Tory controlled Surrey County Council. An ex councillor from Guildford, Chris Ward coined the first witticism and the second was tweeted by the Chertsey Herald. Why? you may ask. 3 years ago, just before the last SCC elections, Andrew Povey led a palace coup against the then leader Nick Skellett, who had previously stabbed Mr Povey in the back when he was leader. They've got nothing on Macchiavelli these guys. There were wholesale changes to the front bench. Two years on Mr Povey's deputy David Hodges led a revolt that saw him elected as leader, and more wholesale changes. Now less than a year on Mr Hodges has sacked 2 of his closest allies, Cllr Ian Lake and Cllr Denise Saliagopoulos. 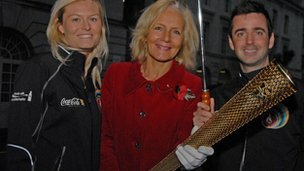 Charterhouse Chancery can arrange packages for visitors to the UK in particular for the London 2012 Olympic Games. The Company is based in Surrey which has excellent connections with London Heathrow and London Gatwick Airports. Surrey's strengths for London 2012 are its proximity to London and the Olympic Park, closeness to Wimbledon for Tennis, it is on the route to the South Coast for the Olympic Sailing and the rowing at Eton Dornay near historic Windsor Castle. A good bit of Tory enterprise you might say, except that they forgot to declare it as an interest, despite the fact that Mrs Saliogopoulis is Cabinet member with special responsibility for the Olympics and the £750 million of contracts that will be generated in Surrey. Mr Lake said it doesn't matter because the company hasn't traded yet. Hmm. Full report and interview with Mr Lake on BBC Surrey. And the company accounts aren't open to public scrutiny as they haven't been filed yet!